The USDA is going to shoot a Mexican wolf, even though she is one of only six successful wild mothers. The US Fish and Wildlife Service and USDA have contrived a way to shoot yet another endangered Mexican gray wolf, one of only 58 in the wild. Wolf F118, head of the Fox Mountain pack, is one of only six successful wild mothers, but the agencies announced Thursday they would shoot her by Friday because of four local cattle deaths in Gila National Forest, NM. The Fish and Wildlife Service has a long history of accidentally on purpose lowering this species’ survival chances. After this wolf is shot, they will have killed 13 on purpose, 18 on accident during capture, placed 32 in captivity and let ranchers kill 43 illegally without much fuss. The federal government has wasted more Mexican wolves than it has saved. Meanwhile, despite a massive breeding effort by biologists and wolf centers around the country, somehow the Fish and Wildlife Service has managed to find a way not to release any new Mexican wolf for about five years. Either they are the worst species managers in the world, or they are just caving to ranching interests. The Mexican wolf has become the most political animal in America. Desert ranchers in the southwest think of the Mexican wolf as he embodiment of federal meddling. They’re kind of like Wall Street bankers who got messed up the economy, got a bailout and now whine about regulation. These guys are graze livestock in semi-barren land, without a shepherd or cowboy to look over them, and with a huge discount on grazing fees at taxpayer expense on public lands. But they still think the federal government is out to get them by returning land to the wild–the 2010s version of the black helicopters. Conservationists see the Mexican gray wolf as the ultimate Obama sell-out. With rancher Ken Salazar as Interior Secretary, the administration has managed to avoid releasing a single Mexican gray wolf in four years. And now it wants to kill one three months before election day. They apparently have four puppies, whose survival chances will be cut if mom disappears. 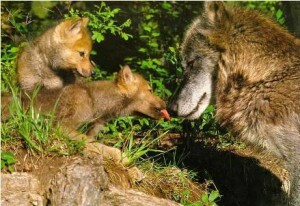 In past years those removing wolves have had a deadline of Oct. 31 in 2009 and Oct. 28 in 2008. MexicanWolves.org suggests calling the White House and Obama campaigns. Sure, I’m still going to have to vote for Obama. But last time I volunteered and donated. This time I think that money will go to the Center for Biological Diversity.